So what makes us happy? Wide open spaces, the sound of palm trees in the desert, a whale breaching just off the coast, getting a photo that perfectly captures what we're seeing. What makes us unhappy? Being stuck in a large city for more than 2 hours, being harassed for money and vehicle breakdowns. What happened to us on our 11th day in Tanzania? Everything listed in that second category. 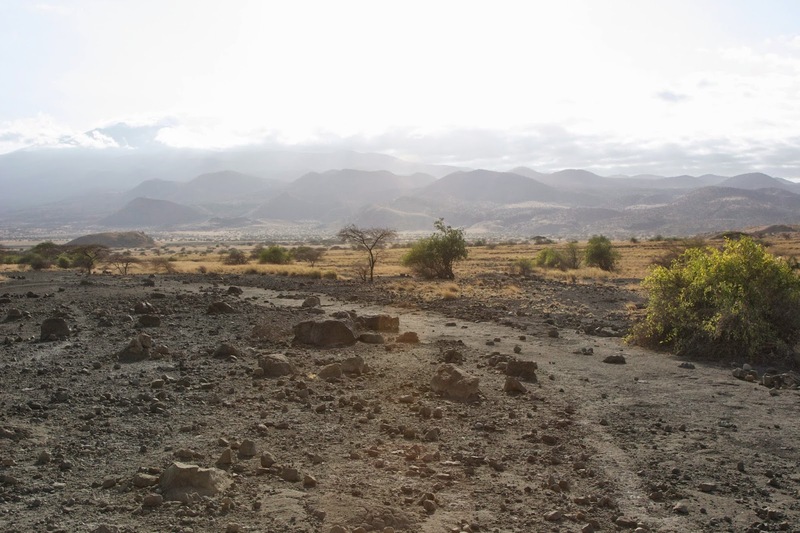 We hated to leave Lake Natron but it was time to move on. We packed up and headed south, skirting the base of Ol Doinyo Lengai on the rutted road to Mto wa Mbu. We waved goodbye to the two giraffe that seemed to always be browsing on the same tree near the village. We took one last picture of the smoking, almost comically perfect cone-shaped volcano. We stopped on a rise and looked back towards the lake, the thousands of flamingos making a pink haze in the distance. Another perfect morning in Africa. Only a few kilometers down the road we spotted a small shack by the side of the road. A yellow-painted tree branch was laid across two home made sawhorses blocking the way. Ah. We'd reached the first of the checkpoints we'd been warned about. A man dressed in olive drab stepped out of the shack to greet us when we pulled up. After the usual pleasantries he told us we owed him $10.00 US each for passage. Sounded pretty reasonable so we handed him $20, which he took inside and carefully filled out a receipt, noting our license plate number in his log book along with the date and time. We asked him about the road condition and he said it was good. We were hopeful that his "good" matched our somewhat modified impression of good, and went on our way. 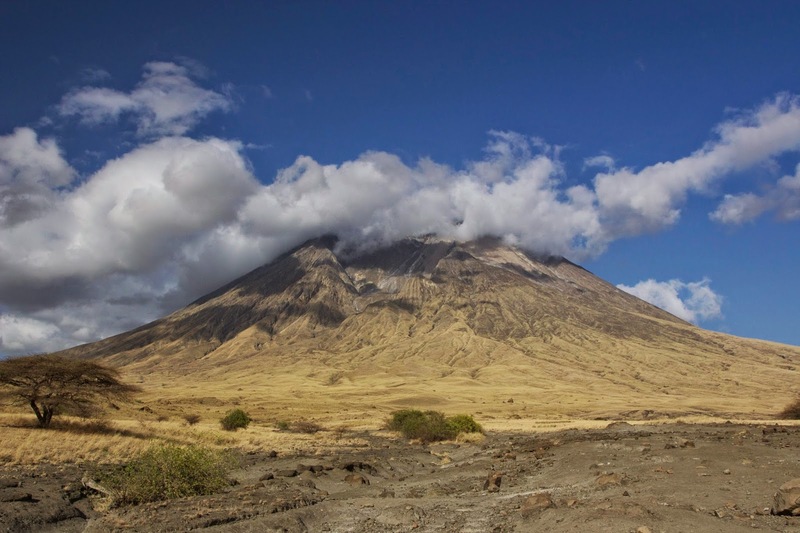 We were traveling across the plains of Engaresero, an ancient volcanic area with sparse vegetation and consequently a sparse population. It was beautiful in the way deserts are beautiful; the emptiness making it easy to see the stark lines of the rocks and mountains. We were glad we had left early in the morning, the colors were soft and what few animals were around were out grabbing breakfast before it got too hot. The rocky road across the Engaresero plains. The road turned out to be fairly decent, the washboard ruts not as deep as in Serengeti, actually smoothing out in a few places. Mark was emboldened by this and pushed the car a little faster than our normal 40 kph. The moment we hit a bump (almost immediately, this was Tanzania after all) the steering wheel almost ripped out of his hands, jerking back and forth. We slowed to a stop and started easing forward again, the steering wheel holding steady. What the hell? After experimenting with speeds it seemed every time we exceeded 35 kph the car would go into it's wobble mode. The slight problem we were having with the steering between Serengeti and Lake Natron had become a major one. We pulled over and tried to call Shaw Safari to let them know. No bars. We drove a few more kilometers and came to the top of a rise. No bars. A lone zebra wonders what's up with our steering. We have that kind of luck; the kind that guarantees no problems right up to the point where we can't get help if we need it. 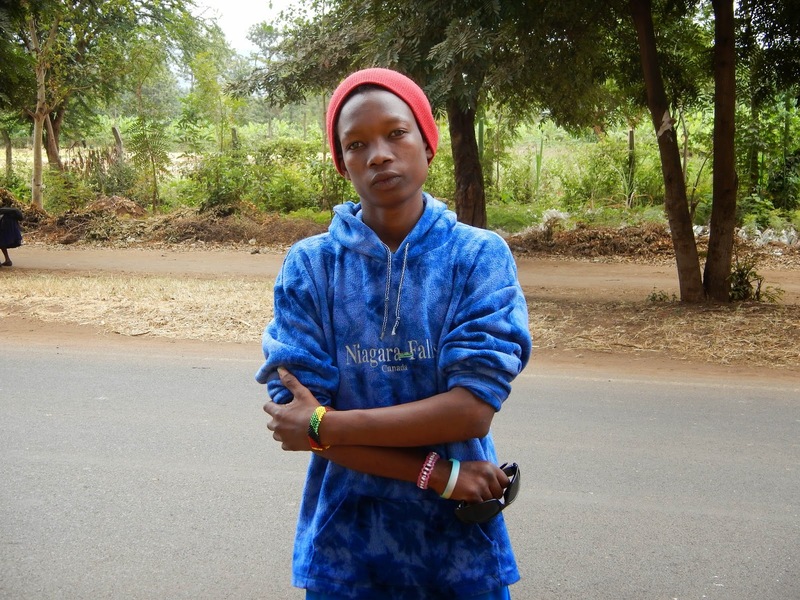 Paul at Shaw had told us he knew exactly what was needed to fix the car (on a call we made to him when we originally started noticing the wiggle) and to give him a ring when we got close to Mto wa Mbu. Now we couldn't get through and the problem was a hundred times worse. What could we do? We went on. At 34 kph, one mile shy of wiggle speed. For those of you unfamiliar with the metric system, that translates to 21 mph. We had 75 miles to go; good thing we weren't in a hurry. About an hour into this journey, we spotted another little shack in the distance. Hmmmm. Someone either chose to build a house right on the road, or we were going to be "tolled" again. Sure enough as we got closer a guy stepped out of the shack and waved us over. "Jambo!" The Toll Taker looked decidedly less official than the last one. He was wearing a pair of acid washed jeans and a ripped sweatshirt with a soccer team logo on the back. "You must pay a toll to pass. It is fifteen United States dollars." We pulled out $15 and handed it to him. "No! EACH!" he motioned toward each of us and pointed to the money. Geez, things seemed to be getting more expensive. We gave him another $15 and he waved us forward. No receipt? we asked. "No. Not needed. I remember you." We could only hope. Blazing down the road at 21 miles per hour, not surprisingly I had a little time to look ahead in our guide book for any interesting roadside attractions. Up ahead somewhere were ruins of an ancient set of villages that had been supported by a complex system of irrigation, an amazing feat considering the lack of rainfall and distant water sources they had to deal with. We spotted a greenish blotch in the valley below and figured that must be it: Engaruka. 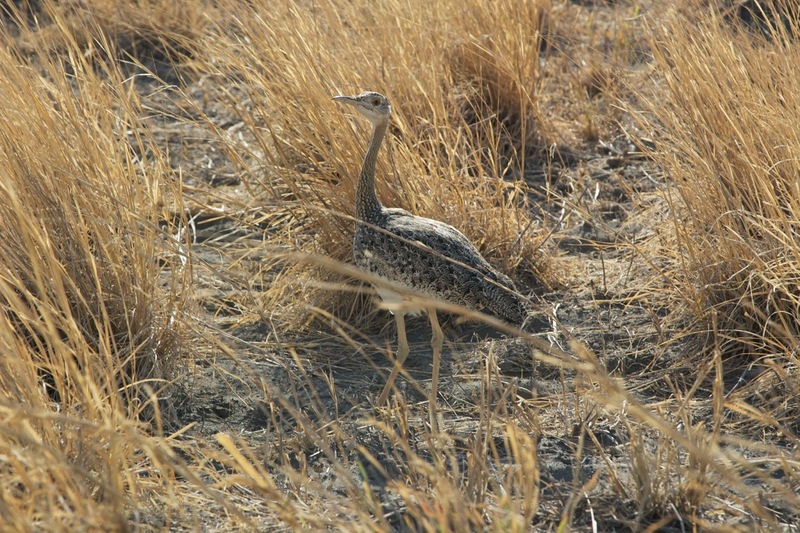 A Kori Bustard eyes us suspiciously from the grass. Maasai have taken over the area once thought to be the home of other tribes (Iraqw and Sonjo) that built the original villages. We passed a few herds of cattle with their keepers on the way down into the valley, waving as we went. We had become accustomed to the stares as we passed by, being in one of the few private vehicles to pass through this area. There was a wide, shallow river running through the middle of the village, around which it seemed all the local cattle were gathered along with their keepers. The road clearly crossed the river and continued on the other side of the crowds, so we turned into the water and slowly made our way across, waiting patiently for the cattle to part. A young man ran out into the river yelling at us. "No no no no! This way! The road goes this way!" We were looking at the road, just 20 feet from us. We pointed to it "Mto wa Mbu?" we asked. "No, no, no! You must go this way for Mto wa Mbu!" We slowly followed along behind the young guy as he motioned us through the parting cattle and staring kids. We rounded a corner and saw the now-familiar tree trunk on sawhorses and realized the source of his indignance; we had unwittingly tried to bypass another toll gate. Our guide ducked inside the toll booth and stood behind the counter. We idled up to the window and he sternly told us we needed to pay for passage through the village. "How much do we owe you?" Mark asked. "Twenty dollars United States." he replied, flipping his log book open and jotting down our license plate number. I pulled a $20 out from our dwindling supply of American money and handed it to Mark. Our toll keeper made a disgusted noise when Mark tried to hand him the $20. "Each. EACH!" This is when things started to go a little lopsided. We were both stressed about the steering problem and lack of cell coverage. We didn't mind paying to travel through an area that was obviously economically disadvantaged, but at this point we had already paid $50 to travel 35 miles. Now they wanted $40 for the privilege of beating our car up for another 35? Quite literally highway robbery. We decided it was worth the risk to try and talk him down. On our first attempt, we willfully misunderstood him and tried to force him to take the $20. "Yes, here is twenty. For you!" "No! Each! Must be each!" In the meantime, an old woman approached with a fist full of necklaces. She stuck her arm in my window and smiled a mostly toothless smile. "Pretty? You like?" she held up a large tooth strung with wooden beads. "Simba! Is simba (lion) tooth!" To illustrate this she clawed at the air and made roaring sounds, menacing me with her gums. What followed was a confusing mash up of haggling for goods and services. Mark and the toll guy were going thirty rounds. "Twenty?" "Each!" "How about twenty-five for both?" "Each!" while the saleslady and I were bargaining "Simba! You like?" "No, very nice. But no money." "Five dollar. Only five for you." "No. Sorry" "Four dollar. Good price!" It was hilarious. The toll was going up almost as fast as the necklace price was coming down. I had no interest in another necklace, even if I was allowed to carry the thing onto the plane (which I wouldn't be) and the toll guy was just getting irritated. A small crowd was starting to gather that included some strong young men that didn't look any happier than our toll guy. We decided to cut our losses and pay him his original price. Some things aren't worth the risk. The unhappy toll guy finally raised the tree trunk and we moved through, crossing the river thirty feet east of our first crossing, joining the road at the exact point we had almost reached ten minutes ago, forty United States dollars lighter. We wondered out loud what would have happened if we had just kept driving and ignored the toll man's yells. Would they have pursued us? How? There didn't seem to be any vehicles anywhere in the village. On second thought, if they did have a motorcycle tucked in there somewhere it wouldn't have been much of a challenge to catch us. Land Rovers aren't really built for high speed chases, especially ones with bad steering bushings. We spent another two hours bumping along, trying to baby the car and checking for reception on every rise in the road. Finally, about 15 miles from town, we were able to get through to Shaw. We made arrangements to meet the mechanics in Mto wa Mbu. All we had to do was get there in one piece. We finally reached the pavement, immensely relieved. As crazy as the traffic can be in town, at least the road was smooth. Mark goosed the car along and got it up to 60 kph. Just as we started to celebrate this incredible speed we hit a bump and the steering wheel ripped out of Mark's hands, front wheels slamming back and forth until the car came to a halt. Back to 34 kph it is then. Our instructions were to call the mechanic when we arrived in town. We found a nice spot in the shade of a banana plantation and parked the car. I dialed the number and as I listened to it ring a young man walked up to Mark's window holding—wait for it—a fist full of necklaces. This was Emanuel, a charismatic, opinionated salesman in a virtual sea of salesmen. Like flies on elephant dung, sales guys (or flycatchers as they're referred to there, somewhat ironically) swarmed around us the moment we stopped moving. It's as annoying and maddening as you'd imagine. And we had no choice but to play along. He started with the standard sales pitch. After wearing us down for ten minutes, Mark gave in and bought two necklaces figuring once the sale was made he would leave us alone. No such luck. Two of his buddies came along and tried to get us to buy but Mark held firm. Nope, don't need any more jewelry of any kind. No. For my part I had hit the limit of good natured haggling back in Engaruka. I've never been one to enjoy bargaining and after the long slow drive from Natron I was tired and sweaty and hungry, not a good combination for pleasant conversation, at least from me. I stayed on the phone a full five minutes beyond the time the mechanic's answering machine picked up, listening to the dial tone to save myself from the sales pitch. I'm not above such behavior, I'll admit. Wasim, on the right, checks his phone while his mechanic replaces our bad steering parts. Roadside, Mtu wa Mbu. At last our mechanic arrived, Wasim's Auto Repair. They pulled up in a beat up Toyota truck, Wasim himself along with a guy in coveralls and a helper. The Coveralls Guy pulled a new steering arm assembly out of the truck, threw a rubber floor mat under our car and slid under. After about ten minutes of clanking and hammering the old one was off, the new one on, right there on the side of the road. Tuktuks, safari vehicles, motorcycles and trucks flew by within a few feet of our makeshift auto shop as Wasim told us how common this problem was. "Every time one of these vehicles goes out for two weeks they need a new bushing. They just can't take these roads. And Serengeti? 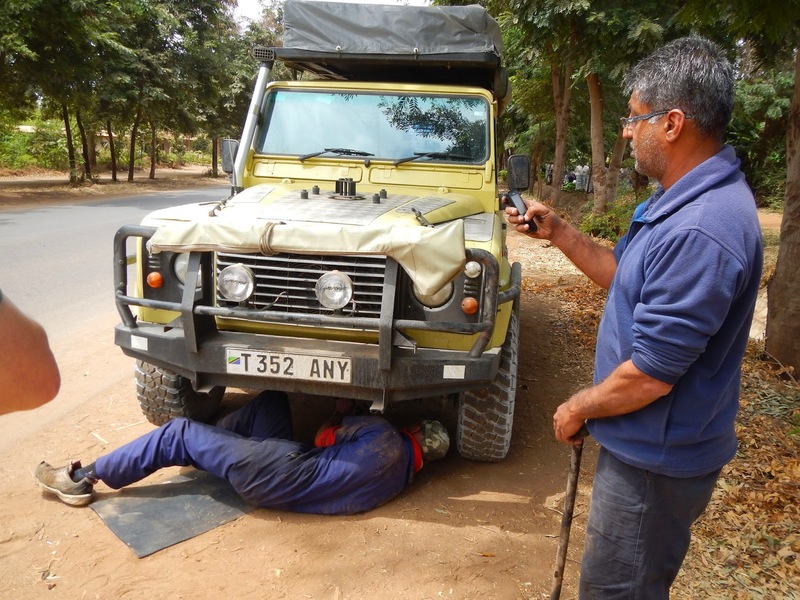 Two days in Serengeti and you will need to change the bushing. I'm surprised you made it as far as you did!" Meanwhile Emanuel was still hanging out, watching the repair and commenting with a gathering crowd on the merits of different makes of safari vehicles. Apparently we were providing entertainment. Once the repair was complete, Wasim told us to drive on and give him a call in five minutes to let him know how the ride was. He was on his way to another roadside repair but could circle back if something went awry. We started the car up and got settled but Emanuel wasn't ready to let us go. "I will take you on a tour of the town. I will show you Mto wa Mbu, no charge." I think he was getting desperate. "No, we have to go. 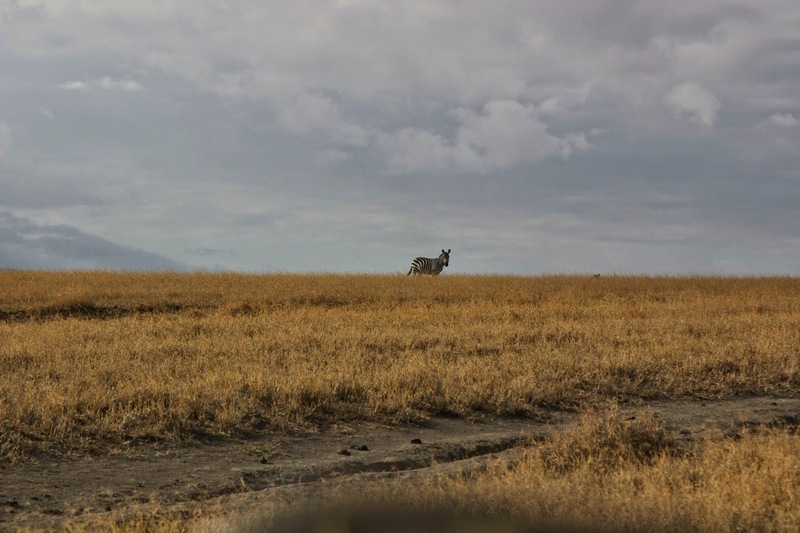 We've got reservations at Lake Manyara and have to be there today." Mark told him. "Come back after. On your way back I will give you the tour. Take my picture, then you will recognize me." Emanuel stood back and struck a pose. Mark felt obligated to take his picture. Sorry to leave you Emanuel. I hope you sold lots of necklaces that day.